Sunday, May 19, 2019 • 1 p.m. Registration is FREE with a $25 fundraising minimum! 100 percent of funds raised benefit Norton Children's Cancer Institute, affiliated with the University of Louisville. Register to fundraise in advance of the big event and then take the big stage on May 19 to have your hair clipped, trimmed or shaved in solidarity with pediatric cancer patients. Join us at 1 p.m. for a live musical performance by Cancer Beats. Clipping starts at 2 p.m.
Plus, there's fun for all in the family-friendly Chili's® Fun Zone with games, crafts, face painting, balloon twisting, shaved ice, giveaways & more! Can't clip, trim or shave this year? That's OK! Keep scrolling for more ways to be involved below! Can't clip, trim or shave this year? That's OK, we have plenty of other ways you can help support the children facing cancer at Norton Children's Hospital. You can select the fundraise only option during registration and simply create an online fundraising page. This option includes our new features such as creating a memorial or tribute page for a loved one or event hosting your own event! ​Another way to help is to Dine & Donate at your neighborhood Chili's Grill & Bar starting April 15! ​We also welcome you to volunteer at the event. See openings here! Interested in being a sponsor of Chili's Clip for Kids? Find out more! Get creative like Bradley and host your own fundraiser. 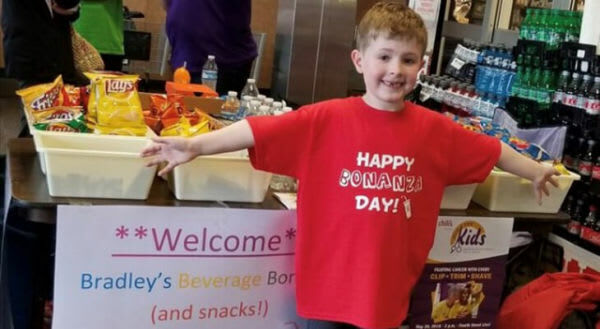 Bradley will host his third annual Beverage Bonanza (and snacks!) stand to benefit Chili's Clip for Kids on April 20 at the Fern Creek Kroger. ​Dine & Donate at your local Chili's Grill & Bar! Thank you to Chili's Grill & Bar for your generous support of Norton Children's Hospital. Starting April 15, stop by your local Chili's Grill & Bar to Dine & Donate. Chili's will present the donation check live on stage at the event on May 19! Click here for more information and to see all participating locations! Another way to support Norton Children's Cancer Institute, affiliated with the University of Louisville, is through purchasing ticket for the Chili's Clip for Kids Raffle! 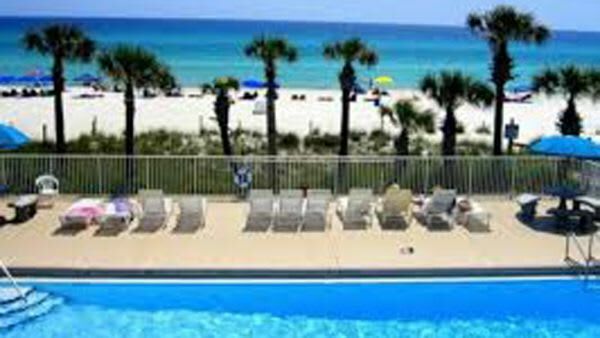 This year's raffle package is valued at a total of $2,500 and includes a 7-night rental of a beautiful town home Panama City Beach, Florida! The package also includes a three-month membership to Burn Boot Camp, a Public Bourbon Tour for Two from Mint Julep Tours, a box for eight to the Churchill Downs Spring Meet and more! For more details and to purchase a ticket, click here!